Tucked among the mail today was a new Boden catalogue. For someone not terribly interested in fashion, I must admit that I really, really like Boden clothing. I first discovered their incredibly cool graphic t-shirts for boys (so beyond the usual stripes and trucks most companies were producing for fellas) and then fell for their amazing prints in their women's collections. I have a particular fondness for Boden's tunics. 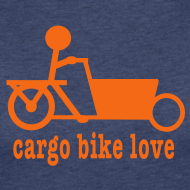 As I was perusing its new women's collection for fall, I came upon a few photos of cargo bikes as props in their pictures, including a beautiful cargo trike with a cute dog as cargo. So the NYTimes last week and now a Boden catalogue-- Are cargo bikes becoming a widespread trend? My commute has changed this summer. While I commute with my older two boys during the school year and my husband brings my younger one to/from preschool, we have flip-flopped for the summer. This has required a bike exchange as well. Therefore, each weekday F and I saddle up on the Xtracycle Radish which he likes to refer to as "The Rocket Bike." Bringing him to his camp increases my daily mileage. I just Mapped My Ride to learn that I am riding over 11 miles each day commuting. Our route takes us right through downtown and through parts of Yale's campus. On the bike, we have the advantage of going up a street that cars cannot currently because of ongoing construction. We hit one, long major hill which I could never pull off with the twins and bakfiets. While it's not part of the ride that I gleefully look forward to, I am happy that report that YES, I am riding up it. All the way. First gear is my friend. When I reach F's camp, I am always extremely hot and sweaty, especially with this summer's extreme heat and humidity. I also do a quick face wash and wipe off my glasses after I get him settled. It definitely helps that I recently had my hair cut extremely short and that during the summer months, my work doesn't require me to dress in any formal manner. And happily, once I leave his camp for my work-- I get to ride down the other side of the hill. Ahhhhhhhhh. This summer, I have seen so many bike commuters. It is great fun and makes me wish we had such an active bike commuting community throughout the year. However, witnessing the array of folks out pedaling these past two months gives me great hope for the future. Next week, F heads off to a new camp, his first 'real' one (not at his regular preschool). He will be joining his brothers at one of my most favorite places here in New Haven for a farm/ecology program called "Sprouts." This camp switch presents a bit of a commuting dilemma. Since P is riding over there anyway with the older boys, it would make sense that he would bring F as well, especially since Common Ground is on the opposite side of town from my work. However, with the boys grown so big, we really cannot take all three on a bike anymore, especially since there is a significant hill on this route as well. Therefore, if he was going to get them all there, he would have to take the car. And this would be a bummer in more ways than one. P has loved being able to bring the other fellows there by bike this past week, especially since pick-up and drop-off are so chaotic with a flood of cars waiting in line to leave or get their kids. P's been able to zip right up the drive and put the cargo bike right up against a tree without any delay. Also, I have a hard time thinking that we must drive to get all three of our boys to this FARM for an ENVIRONMENTAL program for goodness sakes; it just seems wrong. So.... we are going to try this which will require a bit of patience and understanding from my boss and colleagues. I am going to ride the Xtra with one. P will ride the Yuba with the other two. And then, off I will go to work. Yes, I will be later than I have been all summer. And I will definitely be sweaty. But I will get there. And the car will stay parked. At about the 40 second mark, you just might meet a cute pirate who looks familiar and look at that cool pirate ship bakfiets! I have much to blog about-- three new bikes in our house (! ), our bakfiets pirate ship makeover, New Haven's cycling celebration-- but wanted to share this link with my friends who haven't checked out the Sunday NYTimes yet: Hauling Cargo, No Car Necessary. The trikes that George makes are pretty darn fancy. Had to laugh when he said that "glamour moms" purchase and ride these cargo bikes. I am SO not a glamour mom, but now I have another reason to like Kate Winslet. p.s. While getting my toenails painted today, I was perusing a certain celebrity magazine that showed a photo of Kate Winslet riding her fancy cargo trike. I had to track it down-- here it is. Interestingly, this website has blocked out the face of Winslet's son. I did note when looking at the magazine's photo that while he was wearing a helmet, it was unstrapped.... Just saying.